Description: Cap 6 to 12 cm across, flattened-convex becoming depressed and wavy, bluish-lilac to purple-pink at first then more brownish, drying paler. Stem 2 to 5 cm x 1 to 3 cm, often slightly bulbous at the base, bluish-lilac, fibrillose, frequently lilac-colored mycelium at the base. Flesh thick, soft, bluish-lilac to buff. Taste and smell taste not distinctive, pleasant, or slightly bitter; odor fragrant and non-mushroomy. Gills attached to the stem – sometimes by a notch – or beginning to run down the stem; close or crowded; pale lavender to violet or lilac; sometimes grayish purple when fresh; fading to buff, pinkish-buff or brownish in age. Spore print pale pink. Habitat: Singly to gregariously in coniferous and deciduous woodlands, hedgerows, fields and gardens, fall to mid-winter. Primary keys: Lilac cap and gills; attached (notched) gills; no veil; short stout stem; pink spore print; distinctive odor (once learned); lilac mycelium at stem base. Edibility: Fair to choice. It varies greatly in taste and texture, from quite good to not so good. Known to cause gastrointestinal upset if eaten raw. Cut the leek in half lengthwise, then 1/4″ slices across. Slice the fennel bulb into equivalent sizes. Gently saute both in 1 T. oil in a non-stick pan until tender without browning, remove and set aside. 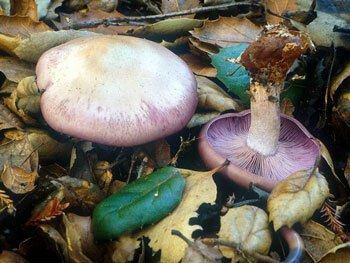 Clean the Blewits and quarter or half them depending on size. Saute gently in 2 T. oil until liquid evaporates and set aside. Quarter or half the potatoes and bring to a simmer in cold salted water, cook until mostly tender but not soft (note that they may cook at different rates), drain dry. Add cooked mushrooms, potatoes, turkey, remaining oil, and salt and pepper to a large non-stick saute pan over medium-high heat, toss frequently until lightly browned & heated through. Remove from heat, add the reserved leek/fennel mixture, yogurt and orange zest. Toss together and serve topped with fennel fronds.